I really like small “selfie drones”; they’re easy to pack away in a bag for travel, they’re lightweight so they aren’t subject to regulatory issues, and they do a pretty good job of taking photos. Up until now, the only one I’ve owned is the $499.95 Hover Camera Passport drone that was sold through Apple retail outlets — although it is appears as “currently unavailable” at this time. Like most consumer electronic products, another company has taken the idea of a lightweight, folding portable drone and is currently crowdfunding manufacturing of a similar product that will ship early next month. The iOS-controlled SimToo Moment Drone can be had for as little as $199 during the Indiegogo campaign, and if you’ve balked at the price tag of the Hover Camera Passport, you’re going to like what you see with the Moment Drone. The Moment Drone in its case with (counterclockwise from left front) car adapter, charger, and battery pack. The Moment Drone shares a common design with most quadcopters with a central body containing sensors, a powerful CPU, sonar to determine height above ground, a down-looking camera for landing, and a gimbaled main camera. Like the Hover Camera Passport, the “wings” fold for compact storage in a carrying case and the propellers are protected by a cage-like structure. That structure appears to be made out of plastic rather than the carbon fiber used in the Hover Camera Passport, but in all of my test flying it managed to survive some spectacularly bad landings and flights into tree trunks without a scratch. The Moment Drone is a bit heavier than the Hover Camera Passport — 14.64 ounces (415g) compared to 8.53 ounces (241.8g) for the Hover. But most of that extra weight appears to be in the battery, which provides a flight time of 15 minutes compared to just 10 minutes for the Hover Camera. Another feature that the Moment Drone has that the Hover Camera doesn’t is built-in GPS/GLONASS support. This provides a “return to home” function that works quite well, even when the camera has lost sight of the pilot. In some of my testing in light breezes, it landed within a foot of the takeoff point; in no-wind conditions, it even landed on the exact spot from where it had taken off. While many of the other “selfie drones” in this category have built-in RAM (the Hover Camera Passport has non-removable 32GB of RAM), the Moment Drone can take any micro-SD card of up to 64GB capacity for storage. 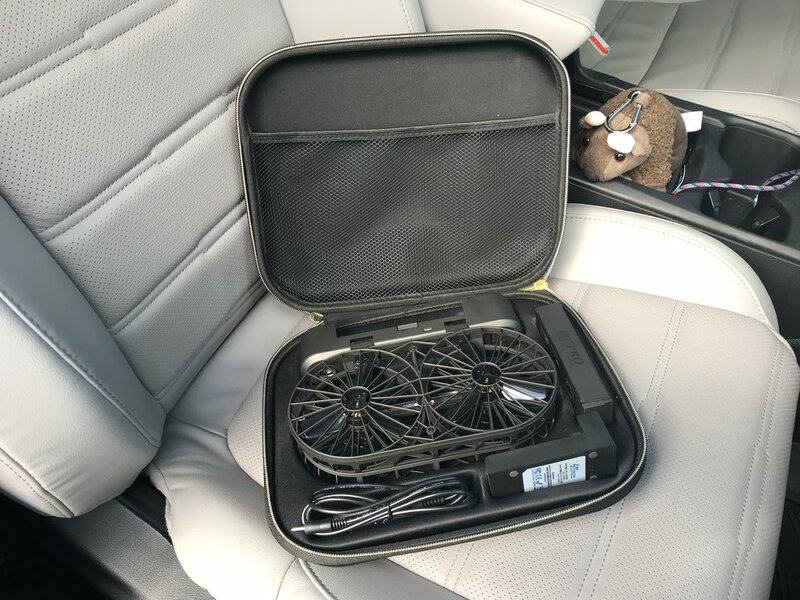 In the carrying case with the pre-production model I received were USB and car chargers — something unique to the Moment — and a single battery pack. Moment is also selling extra flight batteries for $49 ($20 less than the MSRP of $69) during the crowdfunding campaign, so it’s time to get one ordered. There are also no replacement parts with the Moment Drone, which can be a problem if a propellor is inadvertently broken. The Hover Camera Passport includes spare propellors and a small hex wrench for replacing the props. Unlike the all-black Hover, the Moment will come in three different color options — rose gold, champagne gold (which actually looks more like bronze to me), and black. 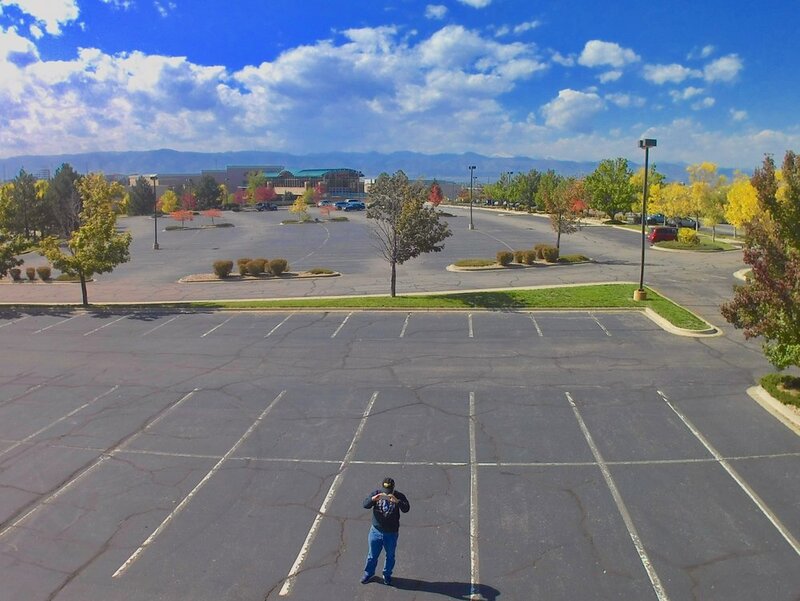 A sample photo from the SimToo Moment Drone. About the camera: it uses a 1/3.06” CMOS sensor with an effective pixel count of 13MP. That offers a maximum image size of 4640x3480, and the Moment can shoot video in 4K (3840x2160 @ 25 fps), 1440p (1920x1440 @ 30 fps), 1080p (1920x1080 @ 60 fps) or 720p (1280x720 @ 120fps). Images are stored in JPEG format, while video is stored in MOV format. The camera has an ISO range of 100 - 3200. One thing that I really like about the competing Hover Camera Passport is that it does pretty much everything under autonomous control if you want it to. That makes it a perfect drone for beginners and youthful fliers. Everything in the controlling app is very simple to understand, and there’s been a lot of work on the UI through firmware updates since the Hover Camera Passport first arrived. The Hover now has a series of short, succinct videos in the app that show exactly how to control different flying modes, so there’s no need to read a manual. With the Moment Drone, I think the developers could do a lot more work on the usability of the app. There are way too many tiny buttons on the screen for the autonomous modes, and it’s quite easy to press the wrong one. On the other hand, I found the Moment Drone much more stable in manual flight than the Hover Camera Passport. Two recent flights were on somewhat windy days that nearly exceeded the 12 mph maximum for the Moment Drone. Upon startup, I had it do an auto-takeoff, which takes the drone up to an elevation of about 1.5 m, at which point it hovers and stays in place. It drifted just a bit during the hover, which wasn’t too bad considering the gusts it had to put up with. The device, of course, uses an app for control using the iPhone’s Wi-Fi. Unlike the Hover Camera Passport, the device name can’t be changed so you’ll always get a cryptic name in your list of Wi-Fi networks. One good feature of the Moment Drone is that it can be set up for different control sensitivities — for beginning pilots, you most likely want to use the primary level, which sets a maximum speed of 1m/s. Once you’ve got a handle on controlling the device, you can set the controls in the intermediate (2m/s) or advanced (3m/s) mode. However, that primary level makes it difficult to react to windy conditions, so if you’re flying in a breeze you’ll want to bump it up to the higher sensitivity modes. Before flying for the first time — or if you’ve moved your flying location a great deal — you’ll want to do a calibration of the magnetic compass and accelerometer. This is an easy process to go through, where you tap a button and then rotate the drone in both horizontal and vertical planes, then place the device on a horizontal surface. In an area where you have a clear horizon and no trees around, the Moment Drone does a good job of using GPS lock to stay in one place. The Wi-Fi range is as good as the Hover Camera Passport, so you’ll want to make sure that you don’t get too far away. If you do lose Wi-Fi, the device should return to the starting point automatically. I finally got signal back long enough on a second flight by walking directly beneath the drone, which was only about 20 feet in the air. I wanted it to do an auto landing, at which point it began doing slow passes over my car (probably noticing that it needed a washing…) and at one point finally going under the car. When it finally flew out, I grabbed it by hand — something that is safe to do. Speaking of trees, I’d suggest staying away from them at all cost. One early flying experiment was done in my back yard, where I had successfully flown the Hover Camera Passport a number of times despite a number of towering trees. Apparently the lack of a good GPS lock thanks to tree leaves can really confuse the Moment Drone, as it went rather bonkers on me in one early flight. When flying in wide open spaces, the Moment Drone behaved…usually. While the auto-takeoff and land functions worked fairly well, I could not get the auto-follow function to ever work in three flight sessions. In addition, the control of the gimbal on the camera wasn’t smooth at all; rather jerky, to be honest. The image stabilization seems to work OK; stills were extremely clear (although tilted because of wind -- something image stabilization won't fix). I wasn't super impressed with the video quality, then I noticed that although I had set the video quality to 4K earlier, it apparently didn't keep that information in flash memory as it had reset to 1080p. I noticed that other settings had to be fixed each and every time I started up the drone. One concern I had about the Moment Drone was addressed by the project team. I was wondering if they’d be releasing firmware updates on a regular basis, which has been a good feature of the Hover Camera Passport. They said that they will release firmware updates on a regular basis once the device is in production and in the hands of users; however, at the present time the updates need to be done through an odd process that doesn’t use the app. You download an “SPHOST.BRN” file (from where, I don’t know, since the Moment website has no support section…), store it in the root directory of the micro-SD card, power on the drone, and then the device runs the upgrade on its own. Maybe I’m a control freak, but I like to see the progress of the file download and installation through an app. The Moment Drone isn’t perfect…but then again, it’s still in development and it actually flies quite well. The biggest draw is the $199 early bird pricing, and even at the MSRP of $349, it’s less expensive than other drones of this type. At $199, I’d have no qualms about recommending the Moment Drone. I’m just hoping that the project team does follow up with a better app and firmware updates to address some of the oddities of the initial release version. As the Moment Drone tested is a pre-production model, I’m not giving it one of the traditional AWT review scores. This IS an Indiegogo project that will ship — the company has already shipped out over a thousand of the devices to reviewers — so you will definitely get your drone. That seems to be a rarity in the world of crowdfunding these days.